Only the second edition of the iconic series of Dated War Maps created by Turner during the Second World War. Dated Events World War Map. 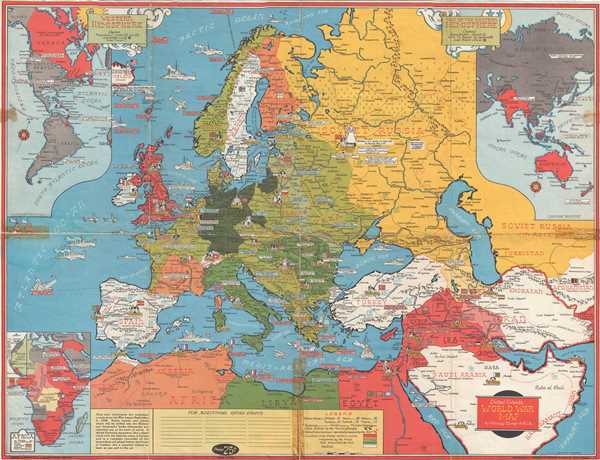 This is a 1941 Stanley Francis Turner map of Europe during World War II. The map depicts the continent from the Atlantic Ocean to Afghanistan and from the Arctic Ocean to northern Africa. As with all of Turner's dated war maps, the Axis and the Allies are differentiated through color. Here, red is used to mark those countries under British military control: Britain and Northern Ireland, Egypt, and the British mandates in the Middle East. The Axis are all shades of green, with Germany the darkest green, followed by Italy (which also controls Libya), and then the conquered countries in eastern and western Europe. Hungary, Romania, and Bulgaria, however, are also shaded a darker green because they joined the Axis instead of being conquered by them. France is divided in two, since, following the armistice signed between France and Germany in June 1941, northern France was occupied by German troops while southern France was governed by Marshal Philippe Petain from Vichy, as were France's colonies in North Africa: Morocco and Algeria. Neutral countries, including Spain, Portugal, Switzerland, and Sweden, are colored white. The flag of each nation is also illustrated, along with a profile illustration of a famous building to mark each capital city, such as the Eiffel Tower for Paris and Big Ben for London. Events dating from the beginning of the war until late September 1941 are noted throughout the continent, including the dates that France and Britain declared war on Germany, the beginning of the German bombing campaign against London, and the evacuation at Dunkirk. Military actions taken by Allied and Axis forces are marked by blue boxes for Axis actions, while red boxes mark British movements, including victories, evacuations, and defeats. Small plane silhouettes dot the map in France, Germany, England, and Egypt, marking cities that suffered sustained bombing campaigns by one side or the other. Ships and airplanes are illustrated throughout, adding to the wartime atmosphere. Three inset maps are included as well. In the upper right corner, part of the Eastern Hemisphere is depicted. This inset bears the greatest argument that this map dates from fall 1941, because none of the Japanese attacks from December 7, 1941 in Asia are noted. In the lower right corner, an inset map of Africa illustrates how that continent was divided between British, Vichy French, Free French, Belgian, and Axis control. The Western Hemisphere is shown in the upper right corner, with only Canada and a handful of other British possessions colored red, illustrating the neutrality of the United States and nearly all of South America. This map was created by Stanley Francis Turner and published by C.C. Peterson in the fall of 1941. Stanley Francis Turner (1883 – 1953) was a visual artist and painter based in Toronto, Canada. Turner was born in Aylesbury, England. He studied art in London at the South Kensington School before migrating to Canada in 1903, where he studied at Ontario College of Art under George Reid and J. W. Beatty. Turner is best known as a painter and designer capable of working in a variety of mediums. During World War II, Turner took a contract with the Globe and Mail to illustrate pictorial maps of war events. Turner may have maintained the rights to his war maps, as he also seems to have had a contract with the advertiser and publisher, C.C. Peterson, also of Toronto, to publish and distribute his maps in the United States. Turner's maps are information dense and designed to illustrate the events of the war in an easily digestible pictorial format. Turner experimented with different ways of working with the cartographic ranging from simple Mercator projections to more contemporary equal-area projections. In 1930, Turner was elected an Associate of the Royal Canadian Academy of Arts. He died in Toronto in 1953. C. C. Peterson (fl. c. 1940 – 1950) was an advertising and publishing company based in Toronto Canada, but with distribution and licensing in both the United States and Canada. Peterson had contracts with the artist Stanley Francis Turner to publish pictorial 'war maps' during World War II. The company supplemented its income by selling advertisements on Turner's maps. Good. Backed on archival tissue for stability. Residue from old tape repairs visible. Blank on verso.